Houston – September 10, 2018 --(PR.com)-- Canidium is kicking off its Platinum sponsorship of the SAP and CallidusCloud Sales Cloud Experience events this week starting with a stop in Atlanta on Tuesday, September 11th followed by Chicago on September 13th, New York on September 18th, Mexico City on November 7th, and Philadelphia, November 14th. Sales and sales operations professionals will learn how the SAP Sales Cloud adds value to the customer and sales experience. David Kohari, Canidium VP of Strategic Services and Customer Success, and Jason Kearns, Canidium VP of Technology Services, will participate in customer panel discussions during the events this week. “Customers and prospects will gain a better understanding of the benefits of the SAP Sales Cloud by attending and talking with our teams at these events. The SAP Sales Cloud provides multiple integrated technologies all focused on improving the sales and customer experience. Additionally, a customer panel will provide success stories and lessons learned rounding out these events,” says Canidium VP of Sales and Marketing, Lee Goldberg. 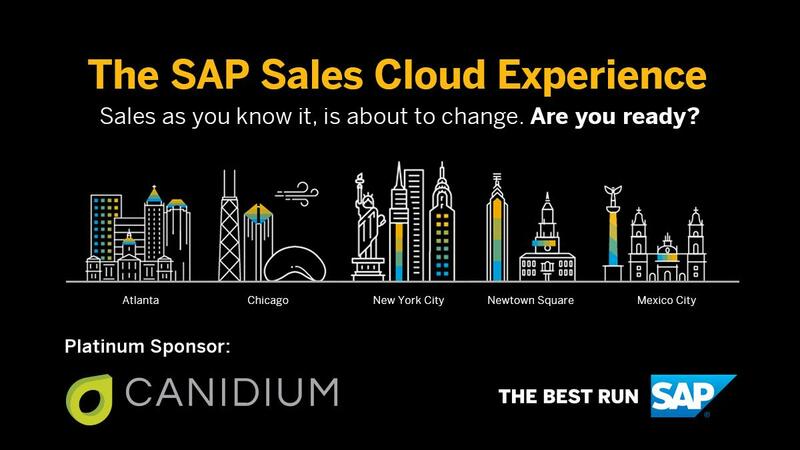 The Sales Cloud Experience events from SAP /CallidusCloud and Canidium will focus on helping companies improve and optimize sales process via solutions such as enablement, learning, CPQ, contract management, and performance management. To learn more about this event or to register to attend, visit https://www.calliduscloud.com/events. Canidium is the leading sales performance, incentive compensation, and sales process optimization consultancy. For greater than 10 years, we’ve offered a unique approach to delivering sales performance optimization solutions aligning process and behaviors with corporate direction. Strategy, technical, and managed services are components of an integrated portfolio that helps our customers achieve their corporate goals and objectives maximizing their sales performance and process investment. Visit www.canidium.com or follow us on Twitter @canidium, LinkedIn at Canidium, and Facebook at Canidium to learn more.